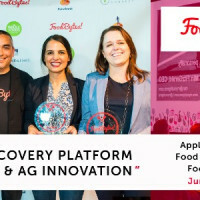 Apply to Pitch at FoodBytes! San Francisco in March! After closing out 2016 with the biggest FoodBytes! yet in Boulder and our first international event in Sydney, we’re excited to work partner with Rabobank to continue that momentum into 2017. FoodBytes! 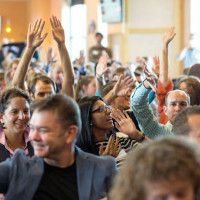 will kick off in San Francisco in March, followed by New York in June, The Netherlands in May as part of F&A Next and Austin, Texas in October. Part pitch competition, part networking event, FoodBytes! brings together the game-changing startups, investors and industry leaders pioneering the future of food and ag. Since launching in 2015, more than 700 companies have applied to pitch to over 1,000 attendees at FoodBytes! events around the world. The exact date and location of FoodBytes! San Francisco in March is being finalized. The application deadline has been extended to Sunday, January 22 at 11:59 PM PT. Selected companies will be notified by Monday, February 1, 2017. Why Should You Apply to Pitch? Apply for the TERRA Food + Ag Tech Accelerator! Looking for another way to take your food or ag business to the next level? 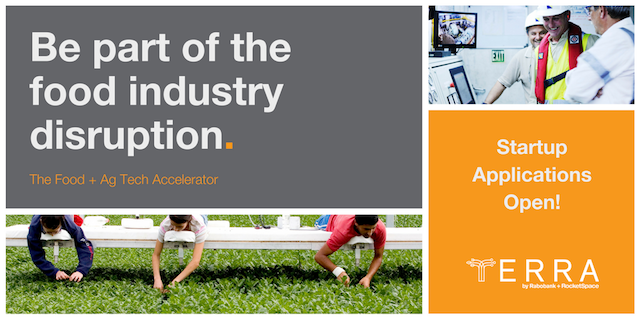 Applications for the first cohort of Rabobank and RocketSpace‘s food and ag tech accelerator, TERRA, are now open! 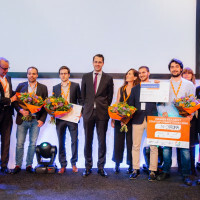 This first-of-its-kind accelerator brings the most disruptive food and ag startups together with progressive corporations to fuel cross-industry innovation. Food, food tech and agtech startups from around the world are encouraged to apply. Applications close on Wednesday, January 18. Selected participants will take part in four month intensive program at RocketSpace’s campus in San Francisco designed to help you validate your products through pilot testing with collaborators, as well as meet corporate partners for potential investment opportunities. No financial equity is required to participate.